The Fourth National Climate Assessment report by the United States Global Change Research Program has unveiled at the end of 2018 the incredible and alarming numbers related to the carbon emissions in our planet. Moreover, the report emphasizes the need for industrialized nations to cut their carbon emissions by almost 50% by 2030! Otherwise, the consequences of climate change may reach a point of no return. Based on this fact, not only we need to migrate to a power grid with more renewable energy sources, but we also need to improve the way we use energy. Industries, manufacturing plants and buildings are the highest consumers in any country, therefore they are the top greenhouse gas emissions producers. The best way to ensure that these buildings reduce their carbon footprint is to guarantee that their energy efficiency is increased. That can be done thanks to EPA Energy Star. Since energy efficiency is so important for our country, it is necessary to establish a system that allows American people to compare the efficiency of their buildings over time. Therefore, to solve this problem, the Environmental Protection Agency (EPA) created the Energy Star program. This program has been a success and has already named some cities for the top energy star certified buildings of America. Becoming a certified energy star building owner shows that you are committed to saving the environment. Besides, you will be able to visualize your efficiency score on the performance of energy usage in the whole commercial or industrial building. 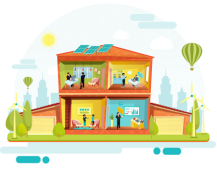 The score allows you to compare your building with others that share the same size, purpose, electrical loads and weather patterns across the nation. What is an Energy Star building? The star rating varies between 1-100. If your score is below 50%, it means your energy performance is below the average performance in similar buildings across the nation. Meaning that you need to make some changes to your electrical installations or in your consumption to optimize energy use efficiently. If your rating is 60%, it means that your building performance is better than 50% of similar buildings in the country, but you are still not energy efficient. In order to be considered an Energy Star certified building, you must achieve a score above 75%. This will indicate that your energy performance is better than 75% of similar buildings nationwide. What are the benefits of having an Energy Star building? The first benefit for your record is that you will have done your part in the fight against climate change. By becoming an Energy Star certified building, you are guaranteeing that the GHG emissions due to energy consumption in your industrial plant or commercial business will be minimum. The second benefit is related to marketing. The EPA Energy Star certification is the most recognized and valuable indicator across the US that shows your building as an energy efficient construction. It will make it more attractive to potential buyers who wish to cut expenses in electricity and will create empathy with customers or buyers who care about climate change. Finally, becoming energy efficient is not only good for the environment, but it is also good for your wallet. One of the most important expenses in any building is related to electricity consumption, electrical appliances or heating and cooling of interior spaces are the main components of that consumption. Ensuring that no leakage or malfunction is costing you money every day, all year long is also financially attractive. How Energy Star ratings are calculated? By uploading your energy use and another type of data into the Portfolio Manager of EPA Energy Star, it is possible to estimate your actual Energy Use Intensity by dividing the energy use between the Gross Floor Area (GFA). Then, it is possible to calculate the predicted Energy Use Intensity (EUI) of your building by establishing the average EUI and making adjustments based on your location and conditions. For instance, if your building has fewer workers, then it means that you need less energy than the average. Also, if your building is located in a really hot place during summer, your building might need more energy than the average building since you will spend more on air conditioning. When comparing your actual EUI with your predicted EUI, it will be possible to determine if your consumption is above or below the average. This will translate into a EUI ratio that will be mapped to establish your score. How important is Energy Star rating? The energy star rating is very important for different entities: building owner, government and consumer. The energy star score indicates to the building owner if it should make some changes in its building to optimize performance over time, saving money and avoiding unnecessary losses in energy. Actually, according to statistics from EPA Energy Star, most certified buildings use 35% less energy than similar buildings without any certification, then they perform better regarding energy consumption. This increases the building value and also means that your building will have less greenhouse gas (GHG) emissions on its carbon footprint. The energy star rating also allows the government to have data and statistics over energy consumption around the country that can be used to establish if the efficiency goals or carbon emission reductions are being achieved. And finally, it is important for the customers or workers in the building as they will work in an efficient and safe environment. How can you improve building energy efficiency? If your score is below 75%, the best step to follow is to make an energy audit. The energy auditor is an experience professional that offers remarkable solutions to solve your efficiency problems. Solutions can be focused on replacing some of the appliances that you use by new and efficient technologies, detecting and eliminating leakage points on cooling or heating systems or making some upgrades in the electrical installation. The Phoenix Energy Group is an experienced company that can help you improve your energy efficiency by offering professional solutions to increase your performance and maximize your savings. If you live in New York City, speak with one of our Building Energy Management Specialists to help with your energy needs!